It’s no secret that governments often make special deals with each other that their citizens don’t learn about until later. The Cuban Missile Crisis (1962), for example, was defused not because a US show of military strength scared off the Soviets, but because the Kennedy Administration made a backroom deal with the Soviet Union to pull American nuclear weapons out of Turkey in exchange. The Iranian Hostage Crisis concluded not with the kidnappers being being overpowered, but with a secret deal by the Reagan-Bush campaign (1979) to “trade” weapons for the hostages. 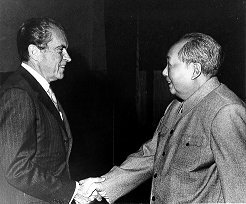 And perhaps most interesting to China watchers: US President Richard Nixon’s secretly arranged visit to China (1972) was not firstly to “promote peace and understanding” between the USA and the PRC. Rather, it stemmed from Chairman Mao, lifelong sworn enemy of Capitalism, and President Nixon, lifelong sworn enemy of Communism, both wishing to further leverage themselves, for different reasons, against the Soviet Union. As we see in this 1972 photo, however, apparently these factors were less important to either leader than making an anti-Soviet Union statement. And that is precisely what Chairman Mao’s invitation and Nixon’s resulting trip to China were all about. For more information about the fascinating deal-making involved in planning this trip, about the meetings and events Nixon and his entourage participated in while in China, and about some of the effects of this historical improbability that still affect us today, you might like to spend some time with the following resources. And remember, it’s as true today as it was in 1972: Politics makes for strange bedfellows. 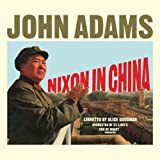 For an excellent introduction to this “secret diplomatic breakthrough that shocked and changed the world”, visit the online resource for Nixon’s China Game, a production of the Public Broadcasting System (PBS). This site, created in support of a documentary film of the same name, includes a summary of this historic event, a transcript of the film, interviews, a timeline of related events and maps, as well as teacher resource. 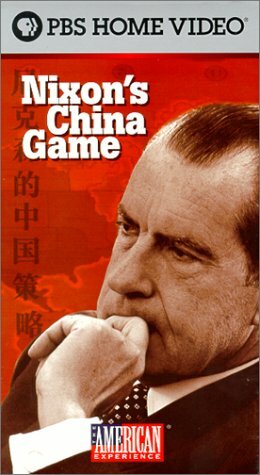 You can also purchase a copy of Nixon’s China Game on VHS video. Be sure to swing by this more home grown site with additional information about the event, including a focus on the “Ping Pong Diplomacy” that contributed to making the trip possible (remember “Forrest Gump”?). There is even a quiz you can take to see how well you were paying attention. Nixon’s trip to China of course alarmed Taiwan, which had until then enjoyed recognition from the US as the “real” China, but it also alarmed the North Vietnamese, who couldn’t imagine why their backer, the PRC, would host the President of their bitter enemy. Read an excerpt from the book Our Vietnam on the University of Southern California web site. Next, view a collection of historic photos taken during Nixon’s visit to China by Ollie Atkins. Atkins at the time was serving as the personal photographer of President Richard M. Nixon and chief White House photographer. 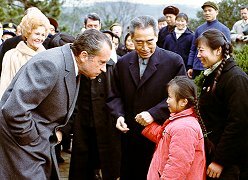 In the photo to the right, Nixon is is being introduced to the little girl holding Zhou Enlai’s hand, possibly Zhou’s granddaughter. That’s Mrs. Nixon seen looking on just behind the President. What is a historical diplomatic moment without its own opera? (Yes, I do actually mean that as a rhetorical question). Finally, if by chance you’ll be in southern California before May 26th, be sure to head over to the Richard Nixon Library and Birthplace in Yorba Linda to view Journeys to Peace: Richard Nixon, Zhou Enlai, and the Opening to China. their diverse paths toward the summit, and their shared goals of reconciliation, peace, and progress for their peoples.